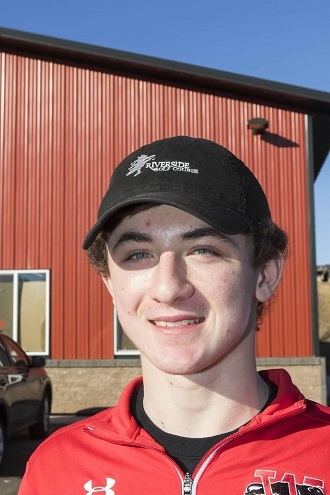 Featuring Southern Lakes Conference second team honoree Zach Strasser, and two other key letter winners, Wilmot Union High School golf coach Greg Olson believes his Panthers squad can stay competitive in conference play. Strasser, who was named team Most Valuable Player as a junior last year, earned a Kenosha County best 75 at the conference meet. Seniors Dayne Schleusner and Josh Peterson are the two other returning seniors. Peterson scored a 79 at last year’s conference meet. The trio played a formidable role last season, when the Panthers advanced to WIAA Division 1 Franklin sectional, courtesy of a second place finish in the Racine Case regional at Ives Grove Golf Links. Strasser, who scored an 80 at the par 72 Ives Grove course, finished tied for fifth among 40 golfers. Schleusner, meanwhile, placed 13th with an 84. At the Franklin sectional held at Oakwood Golf Course, the Panthers were fifth. Last year, the Panthers narrowly missed second place in the final conference standings, coming up two points short of Westosha Central, which had 12 points. Finishing behind Wilmot was Union Grove, which lost conference player of the year, senior Eric Chambers to graduation. For team state qualifier Westosha Central, the Falcons are without seniors Zach Kramer and Bailey Menarek. Like Union Grove and Westosha Central, the Panthers lost key seniors Cody Faber, conference honorable mention, and Ben Roszko. Faber was eighth at the Racine Case regional and was 11th. To fill the void, Olson looks to Devin Spath, Augie Horak and Connor Stickels. The Panthers first two meets of the season were postponed because of inclement weather, including an April 5 opener against Westosha Central, Elkhorn, Union Grove and Waterford.